When we think of the likelihood of an asteroid, comet or meteorite hitting Earth, our mind immediately goes back to the famous event that caused the mass extinction of almost all the dinosaurs, which occurred about 65 million years ago, also known as the KT extinction. Another equally famous, though not worldwide event, is the meteorite impact that occurred in June 1908 in Tunguska, in central Siberia. The shock wave that originated from the meteor explosion in the atmosphere caused the destruction of a vast forest area. More recently impact events have concerned other planets of the Solar System; examples are the impact of comet Shoemaker-Levy with Jupiter in 1994 and the meteors colliding with Saturn’s rings observed by the Cassini spacecraft between 2009 and 2012. In each of these events, huge amounts of energy are released, which in the past have also led to the extinction of numerous living species on Earth. What information is available today regarding bodies that may hit Earth? Can any measures be taken to prevent a collision with them? Asteroids, also known as minor planets, are rocky fragments ranging widely in size, which originated during the formation of our Solar System about 4.6 billion years ago. The first asteroid was discovered in 1801 by Father Giuseppe Piazzi at the Palermo Observatory. It was named Ceres and was considered the eighth planet for half a century. However, from 2006 it has been classified as a dwarf planet like Pluto, Eris, Makemake and Haumea. From that distant 1801, over 300,000 asteroids have been identified and catalogued and probably other hundreds of thousands, maybe a million, are still to be discovered. 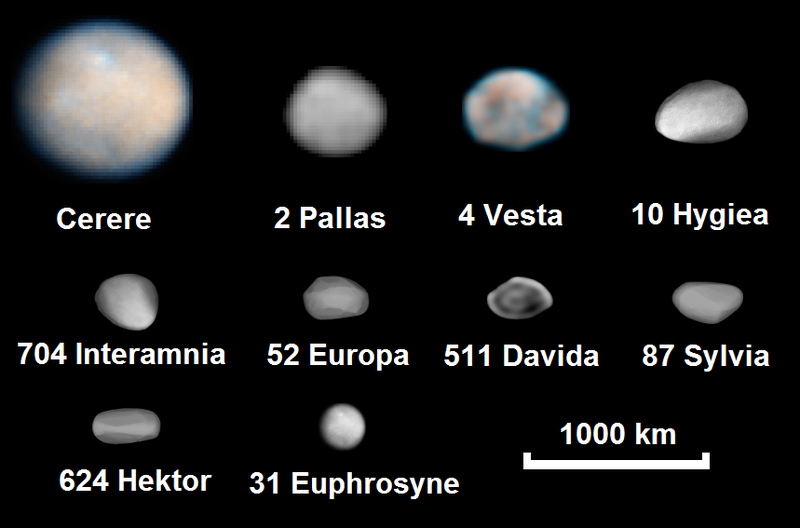 There are just 26 asteroids with diameters over 200 km; among these is Ceres whose diameter is 900-1000 km, followed by Pallas and Vesta both with diameters of about 500 km. The rest of the asteroids has smaller dimensions, with diameters ranging from below 200 km to just a few metres. The vast majority of asteroids orbit the Sun in a region between the orbits of Mars and Jupiter, called the Main Belt, more precisely between 2 and 3.3 A.U. (1 A.U. = 150,000,000 km, the average distance between Earth and Sun). Well separated from the Main Belt, within the orbit of Jupiter, are asteroids such as Hilda and Thule. Besides the latter, there are two large groups of objects that share Jupiter’s orbit, in two equilibrium points (called Lagrangian equilibrium points). These groups are called Trojans and are several hundreds of thousands, one group is behind and one in front of Jupiter’s orbit. Lastly, there is another sub-population of asteroids generally divided into three groups named Aten, Apollo and Amor. Their orbits extend to the innermost region of the Solar System. In particular, Aten asteroids have a semi-major axis of less than 1 A.U, but their aphelion distances (maximum distance from the Sun) are greater than Earth’s perihelion distance (minimum distance between Earth and Sun, 0.983 A.U.). 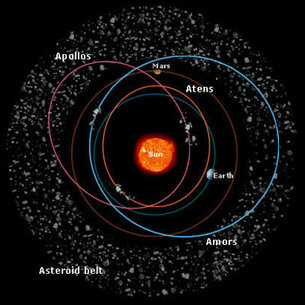 Hence Aten asteroids lie primarily inside the orbit of the Earth, but at their aphelion they might lie outside Earth’s orbit. Apollo asteroids instead have a semi-major axis that is larger than Earth’s and a perihelion distance less than Earth’s aphelion distance (1.017 A.U.). Consequently, these asteroids spend most of their time outside Earth’s orbit but are briefly within it. Lastly, the Amor asteroids have perihelion distances between 1.017 and 1.3 A.U. hence between the orbits of Earth and Mars. In short, asteroids are generally defined as minor bodies of the Solar System with sizes of at least a few tens of metres across and whose orbits never go beyond that of Jupiter. Trojans are included in this category. 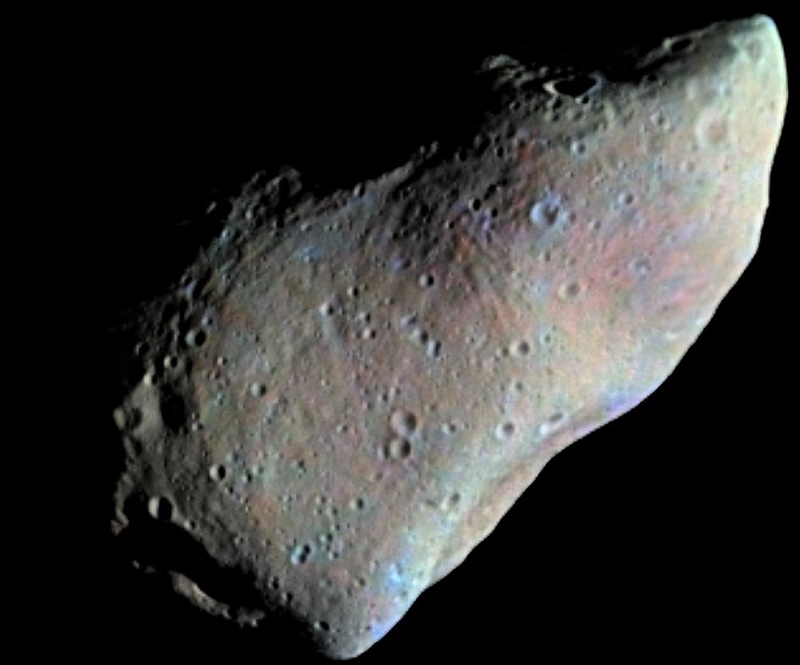 Nearly all asteroids are irregular in shape, although some are almost spherical, and they often have a cratered surface. As they revolve around the Sun in elliptical orbits, asteroids also rotate, sometimes quite erratically. To date over 150 asteroids have been discovered with a small companion moon. There are also binary and triple systems made up of two or three asteroids. Asteroids are subdivided according to their chemical composition into three major types: C, S and M. The different composition of asteroids depends on their distance from the Sun at the moment of formation. C-type asteroids are the most common variety and are rich in carbon. They are very dark and are concentrated in the outer part of the main belt. S-type asteroids are made up of silicates, nickel and iron; they are mainly found among Apollo and Amor asteroids. M-type asteroids are completely metallic in composition, made up of nickel-iron. The acronym NEO refers to all objects whose orbit brings them near to terrestrial planets. Asteroids can be found in different areas of the Solar System and besides revolving around the Sun, their orbits are also affected by forces that are difficult to predict. 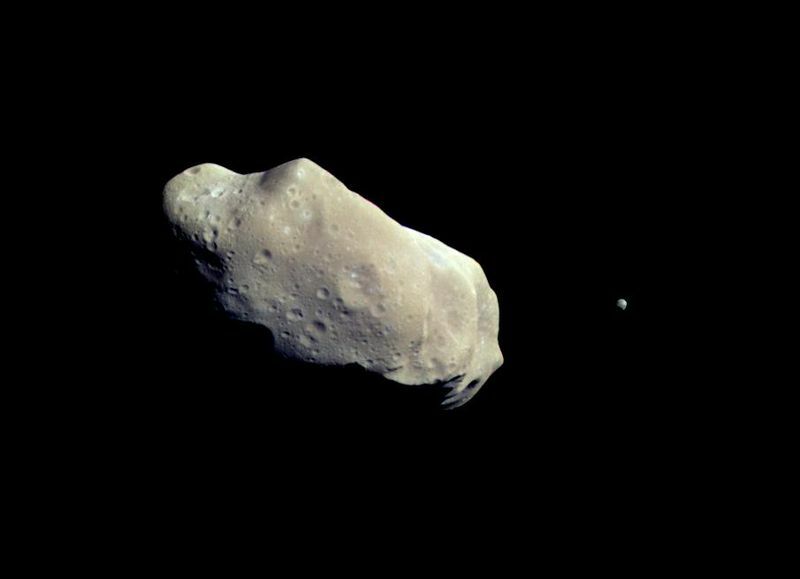 One of these is a collision with other asteroids that could result in the break up of the objects involved. The fragments produced can reassemble to form a new object or move along independent trajectories thus creating new asteroids. The collisions do not hurl the asteroid far from the impact zone, to make it become a NEO, for example. For the trajectory to be modified substantially, some dynamic processes must also take place, which change the orbital parameters significantly. Gravitational perturbations caused by a giant planet can change orbital parameters such as eccentricity and orbital inclination in a relatively short time, reducing the perihelion distances of these objects. Hence, an asteroid captured by a perturbation might cross the orbits of the planets Mars, Earth, Venus and Mercury and come into the inner Solar System. 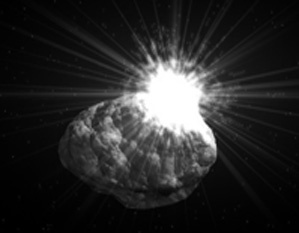 Frequently the perihelion of these asteroids moves closer to the Sun and they end up colliding against it. This process eliminates the problem of that asteroid. As their eccentricity increases, not only does the perihelion increase but the aphelion moves further away; hence the objects of the main belt that are affected by gravitational perturbations can reach the orbit of Jupiter and be subsequently ejected from the Solar System. Both these phenomena are in our favour. Hence some asteroids hit the Sun and others are hurled into the outer Solar System and yet others can be affected by the inner planets. Although the mass of these planets is greatly inferior to that of Jupiter, they can have a perturbing effect on asteroids, and bring them into contact with their orbits. Naturally, the greater the mass, the stronger the ejection mechanism will be. Earth and Venus are among the most probable candidates, having a greater mass than Mars and Mercury. When these conditions occur, the asteroid that changes its orbit becomes an object that might collide with Earth and is called NEA (Near Earth Asteroid). In this phase, the asteroid’s orbit is chaotic because it is influenced by continuous close encounters with the inner planets and hence a prevision of its long-term trajectory is very difficult. Therefore, one of these asteroids could potentially hit an inner planet, especially Earth and Venus. NEAs have been further subdivided, and the subset of PHAs (Potentially Hazardous Asteroids) has been introduced. PHAs are NEAs which have a higher probability of colliding with Earth; in fact their minimum orbit distance with respect to Earth is less than 0.05 A.U. and they are larger than 150 metres in diameter. To date at least a thousand of these objects have been identified, among which the famous Apophis. The latter came close to Earth in January this year and will pass by again in 2029, when the asteroid will brush past Earth at a distance of 30,000 kilometres, about one-tenth of the distance Earth-Moon, keeping at a safe distance, however. We can stay calm, Earth is not in danger. Predicting the trajectory of an object forced to move under the influence of different planets is practically impossible. This is generally defined as the N-body problem, which does not have a simple solution as in the case of Kepler’s laws, which apply only when there are two bodies. So let’s discard the analytical interpretation of the phenomenon. There are numerical integration methods which consist in simulating the orbit of an asteroid and reconstructing, at short time intervals, the positions of all the objects involved. Simulation precision increases with the decrease in the time interval taken into consideration. However, it must be underlined that it is impossible to predict asteroid collisions for time intervals beyond 100 years. 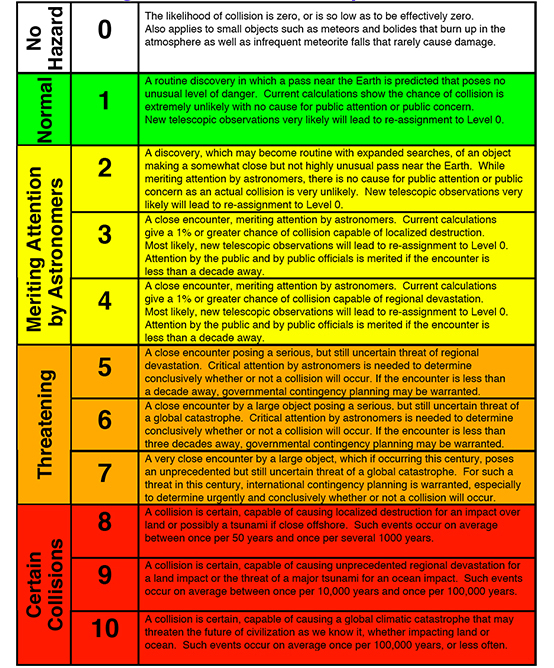 A curiosity: in order to determine the impact hazard of each NEO in an objective way, a scale has been adopted, similar to the Mercalli intensity scale for earthquakes, known as the Torino Scale, because it was proposed during a conference held in Torino (Turin) in 1999. Although NEAs are dangerous, they undoubtedly possess some characteristics which make them particularly interesting. First of all, since they vary widely in composition and origin, they are objects that can be used to obtain a more accurate understanding of the mechanism that led to the formation of the Solar System. Secondly, they can be easily reached when they pass into the inner Solar System, since it is cheaper to send up probes and make spacecraft land on their surface, due to their low mass. The enormous interest they have aroused is due largely to their composition: NEAs, in fact, are attractive sources of raw materials such as iron, nickel, cobalt and platinum. Currently it is not worthwhile to extract these minerals to bring them back to Earth. The transportation costs are too high. However, these raw materials could be used to develop space structures and to generate fuel for future missions to explore and colonise our Solar System. 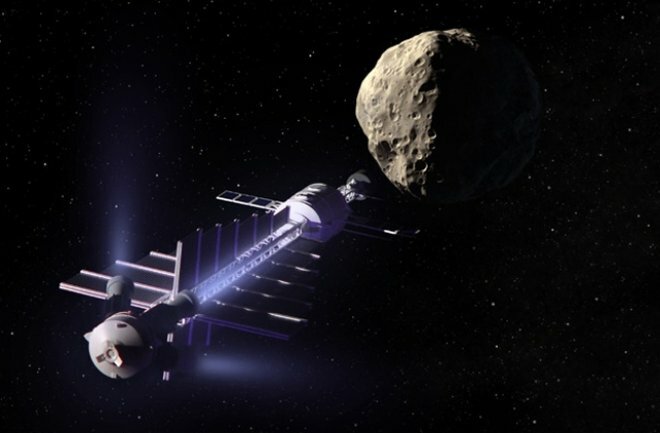 There is an unresolved doubt: when raw materials are extracted from asteroids, who will they belong to? Currently, outer space remains an area without private property rights or speculation. The worry is that in the future the situation could change rapidly. We now know that the Earth has been hit at regular intervals by space objects. 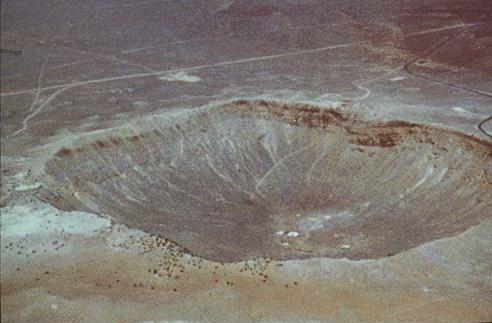 Evidence of the collisions are the craters found on the surface of our planet; these craters range in diameter from a few metres up to 300 km. Since there is an impact risk, nowadays NEOs are monitored and studied through a network of American astronomical observatories. At the same time the best techniques to adopt in case of a potential Earth impact event are being evaluated. There are two basic strategies regarding this last point: diverting the object from its collision path or trying to destroy it. These strategies can be carried out with both nuclear and non-nuclear techniques. In fact, both to deflect and to disrupt an asteroid, nuclear explosives can be detonated. The choice of whether to pulverise or deflect an NEO depends on its mass and also on the warning time before impact. The problem with using nuclear devices is that there is always the possibility that the asteroid might break up into fragments that are able to continue on their course towards Earth, thus amplifying the problem. Currently even non-nuclear strategies are being examined to deflect Earth-threatening asteroids or comets. Among the most interesting is the “space tugboat”; as the name suggests, this strategy involves the use of a space device which is capable of activating an ion-propelled engine once the asteroid has been captured, and which employs a low-thrust tug for a prolonged period of time. In this way the asteroid orbital period is shifted enough to prevent it from impacting Earth. The functionality of the ion propulsion engine has already been tested on the Deep Space probe, launched in 1988. 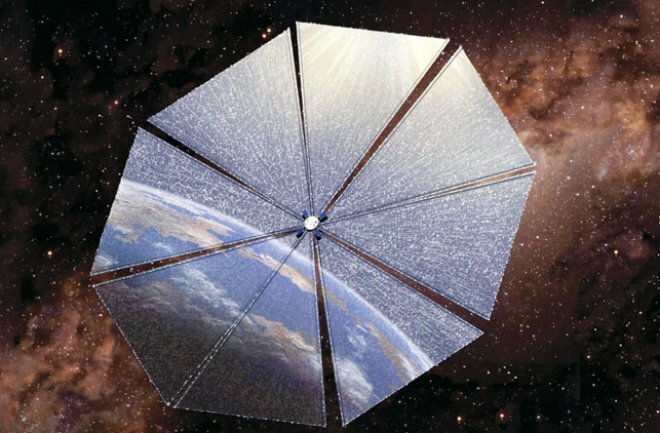 Another method envisages the use of solar sails that use solar radiation pressure to produce a small but constant thrust on the asteroid in order to deviate it sufficiently. The problem with these methods consists in the fact that neither of them have been adequately tested and are certainly more difficult to implement with respect to nuclear strategies.